Both the New York City Council and the Department of Environmental Conservation have either changed current laws as we know them or have revised codes that have been in effect for years. The New York City Council voted unanimously last October to expand Local Law 84 (LL84) – part of the city’s Greener, Greater Building Plan passed in 2009 – to bring even more buildings into its energy efficiency fold, which was then signed into law by Mayor Bill deBlasio in November of 2016. LL84 requires owners of large buildings to annually benchmark their energy and water consumption in the U.S. Environmental Protection Agency’s ENERGY STAR Portfolio Manager, an online tool that measures all utilities. After measuring and recording the data, property owners then submit usage data to the City by May 1 through Portfolio Manager. Building owners that do not conform are penalized at $500 per quarter until submitted. As LL84 was originally written, buildings over 50,000 square feet are required to submit their usage data. But the new ruling now expands coverage to buildings 25,000 square feet and above, something building owners should be aware has occurred. 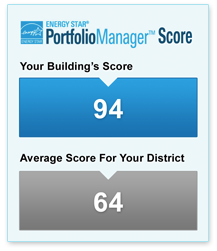 After submitting data, each building is given, an ENERGY STAR score based on its energy efficiency. This score is a screening tool that helps building owners and managers asses how their buildings are performing and assists them in identifying which buildings need improvement. The median score is 50; 75 is very good; and 100 is the best you can be. Achieving these scores is not has difficult as it may seem. Attention to insulation, on all hot water and steam pipes, 3” and larger in diameter is a great start and eliminating drafts from exterior doors is a big plus. The lack of weather stripping at exterior doors allows for heat to escape and warrants the boiler to operate longer to maintain heat in common area spaces. Maintaining the domestic hot water temperatures at the prescribed 110 – 120 degrees, will also keep the boiler from operating at longer intervals, using more fuel. Repair or replacement of electric motors that are not operating as designed and eliminating all steam and water leaks. Attention to these items will raise the ENERGY STAR score and will increase the value or the property. Second law to keep in mind in 2018 is the Petroleum Bulk Storage Code and the DEC-Regulated fuel oil tanks. This has become one of the biggest compliance problems plaguing owners and managers. The DEC (a New York State agency, as opposed to a NYC agency) revised regulations in 2015 for tanks with volumes greater than 1,100 gallons. Violations are being issued for tanks that fail to comply with items such as improper secondary containment systems, no leak detection, incorrect paperwork, tank access, and more – some in excess of $15,000. Also included is a mandatory court hearing. An owner should know what tank system they have in their facility. Tanks fall into one of two types (Aboveground Storage Tank or AST, or an Underground Storage Tank or UST), and one of three Categories (Category 1, 2, or 3). Depending on how your tank is classified, it will be impacted by specific regulations and requirements of different monitoring and testing procedures. Underground Storage Tanks are defined as tanks that have 10% or more of their volume beneath the surface of the ground or covered by materials. 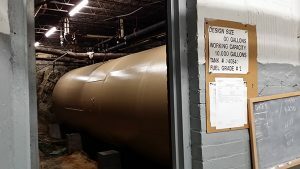 Exceptions to this definition are tank systems in an “accessible underground area” (where you can walk around the entire tank and see the top and bottom), or tanks that are completely above ground and enclosed by pre-fabricated secondary containment or insulated to store heated petroleum. With that said, “covered by materials” can include situations where tanks are fully encased in concrete/concrete blocks. All other tanks outside of these specifics are designated as Aboveground Storage Tanks. Categories are sorted strictly by date. All tanks installed before December 27, 1986 are Category 1 tanks. Tanks installed from that date through October 11, 2015 are designated as Category 2 tanks and tanks installed after October 11, 2015 are considered Category 3 tanks. Knowing what is required for your tank is critical as the code is specific for each Category. A Category 1 UST must be tested annually by a qualified tightness tester and all test results submitted to the DEC. The annual test can be waived if weep holes exist at the base of the encasement. A tank with weep holes must be inspected on a weekly basis and inspections documented for review by the DEC inspectors upon inspection. A Category 2 and 3 UST fall under different criteria of the code and must be strictly followed. Failure to understand what tank exists in your facility can lead to following wrong procedures of visual and instrument guided inspections. This stands true for all AST systems as well. All facility owners should understand what needs to be done with their fuel storage system by sitting with someone who is well versed in the code and understands the compliance issues of the revised Petroleum Bulk Storage Code. If you have any questions, we’re here to help with the above laws as well as you oil, gas and electric needs. 45-17 Marathon Parkway, 2nd Flr. © Copyright 2016 Original Energy. All rights reserved. Website designed by MSM DesignZ, Inc.